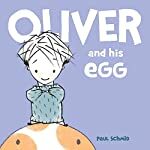 Oliver and His Egg by Paul Schmid. An Oliver Book. Review: Have you ever wished for a friend who would go on adventures with you? If so then you can relate to the book Oliver and His Egg by Paul Shmid. It's a good book to read to a child who is six or seven years old. Oliver imagines this egg will hatch and grow into his best friend. He believes that they will go on adventures to places. But then, he realizes he needs his other friends too. So he adds them in his imagination and they all go on exciting adventures together. This is a great book for kids six or seven because it's not very hard to read. It uses basic words that a six or seven year old can read. Even a boy or girl can enjoy this book. They'll love the fact that this boy has an active imagination. We would like to thank Disney Publishing Worldwide for providing a copy of Oliver and His Egg for this review. Have you read Oliver and His Egg? How would you rate it?